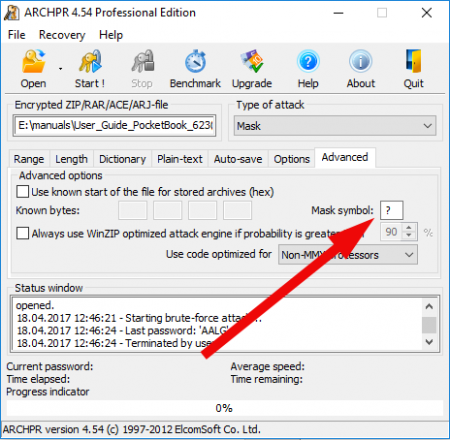 If you forgot a password to important WinRAR archive file, there is no need to panic. Although you may need some period of time in order to unlock a file without a password, it is still possible. 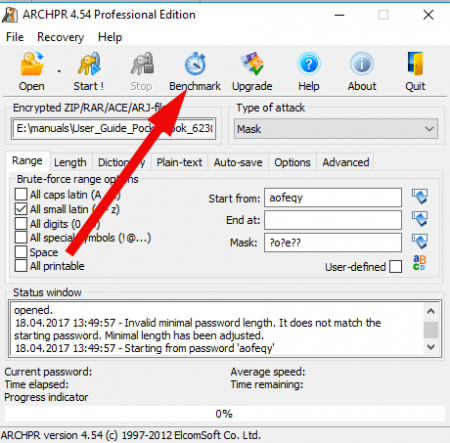 So let’s not waste time and get to the point: how to remove WinRAR file’s password. In this article I will describe this topic more precisely. In order to restore a password, we will need a brute-force attack in order to sort out the required word among all the possible variants: letters, digits and signs combinations. The more the length of the password, the more time you may need to restore it. 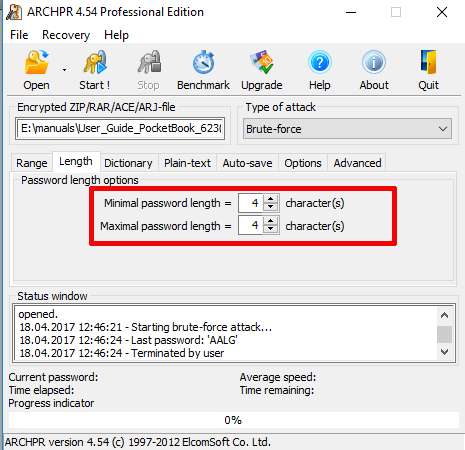 If you know, what is the length of the password before the brute-force attack itself, it may severely decrease the time for processing. Also pretty considerable assistance will be provided by the fact, that the appropriate symbols are located on the corresponding positions in the password and setting this condition up in the utility (for instance, you know, that the letter “a” stands out as the 5-th symbol, and the sign “%” is hidden in the 8-th symbol position). In order to complete such an attack, we may need specific program tools, one of most professional of them is Advanced Archive Password Recovery, the trial version of which you may download on the mentioned before link. The trial version works with some limitations during 30 days, but you may try to use this time wisely in order to seek out the password for your archive. Download the distributive file of the project from the official page and install it on the hard drive. This process is absolutely straightforward, just follow the wizard instructions. Now run the program. The welcome screen suggests you to set the method of attack and customize the additional options. The main option here is the “Type of attack” field. 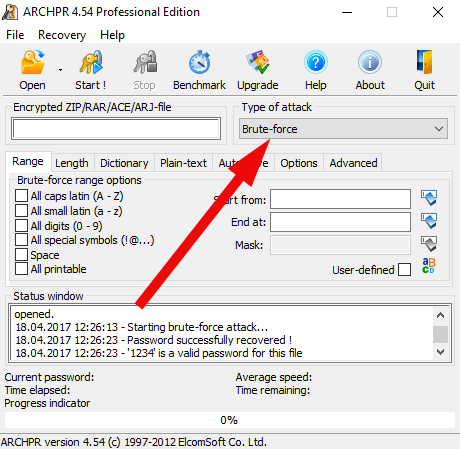 The first option is brute-force. This method is defined as the automatic picking out of all the possible symbol combinations: it can be all caps latin, all small latin, all digits, all special symbols, spaces and all printable characters. You can manually customize the range of search by setting the appropriate checkboxes in the corresponding fields. Any information you remember about the content of the password will decrease the search time. One more important field is the length setting up. If you remember precisely, how many positions your password contains, go to the “Length” tab, and set up the appropriate starting and ending length for the attack. For instance, if you remember, that the password contains exactly 4 symbols, set the “Minimal password length” and “Maximal password length” fields values as 4. 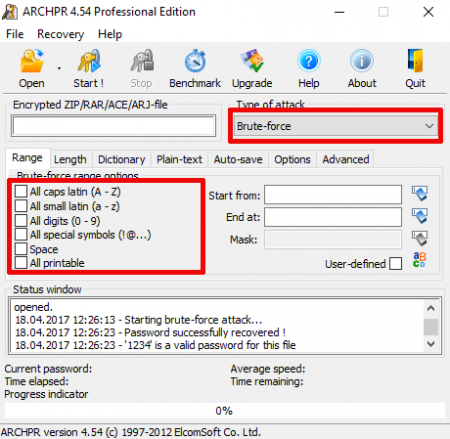 The brute-force attack is the slowest operational method, but it allows to find the most sophisticated and complex passwords. The next method of attack is by mask. If you know that your password consists of the 6 symbols, 2-nd of which is digit “2”, 4-th is symbol “#” and 5-th is letter “e”, you may define the following mask on the “Range” tab: “?2?#e?”. Such an attack will be equal to disabling a password of 3 symbols. If your password contains the “?” symbol, on the “Advanced” tab you may set the different character defined in the mask as any symbol included. The third attack type is dictionary. This particular method will be helpful, if your password is a dictionary word. In the utility there are 3 embedded dictionaries: English (242965 words), German (80472 words) and Russian (75459 words). You may add additional dictionaries from the external files. By the way, you can use only one dictionary simultaneously. Comparing to other attack types this method is the fastest, but there is a very high probability that your password doesn’t belong to any of the dictionaries. 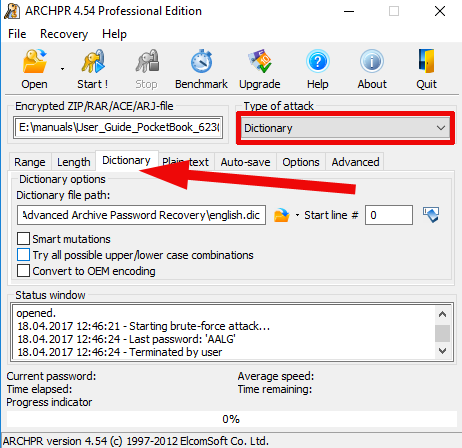 Set up the dictionary file on the “Dictionary” tab, preliminarily defining attack type as dictionary appropriately. The plaintext attack type can be used if the operational archive consists of several files, and you have one of those files not encrypted. In this case such an attack type allows to decrypt all the rest archive files disregarding of the password complexity. 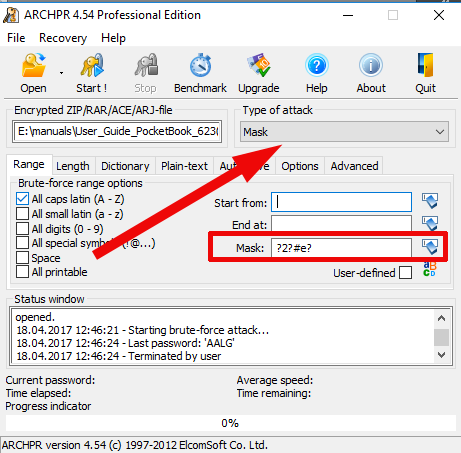 Another useful feature contained in the Advanced Archive Password Recovery utility is the Test Benchmark functionality. After defining the proper WinRAR password file path, you may click on the Benchmark icon in the top graphical panel and after 10-15 seconds the detailed information will appear on the screen, where you may see how much time would you need in order to pick out a password considering all customizations and options, set up before. 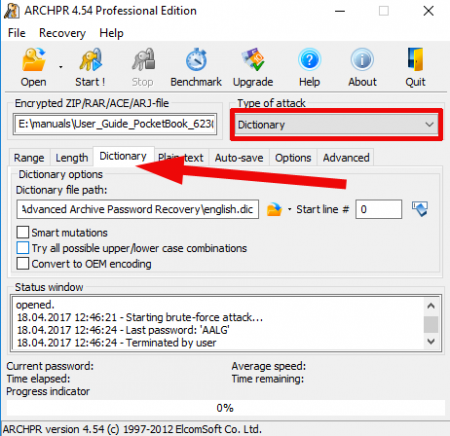 the Advanced Archive Password Recovery tool doesn’t actually remove the password from the file. Actually it decrypts the password definition, and after the resulted password for the file would be found, the notification form will appear on the screen, where the password is represented. Don’t hurry to close it, just write out the code word on the secured location and input it manually in the WinRAR archive password request form. You should know, that all the password disabling software works in the similar way. If you forgot a password, there is no another way to unlock WinRAR file without password, than generating it by trying each discrete letters, digits and symbols combination. You may need pretty huge amount of time, but if the file is important, the result would definitely worth the efforts.